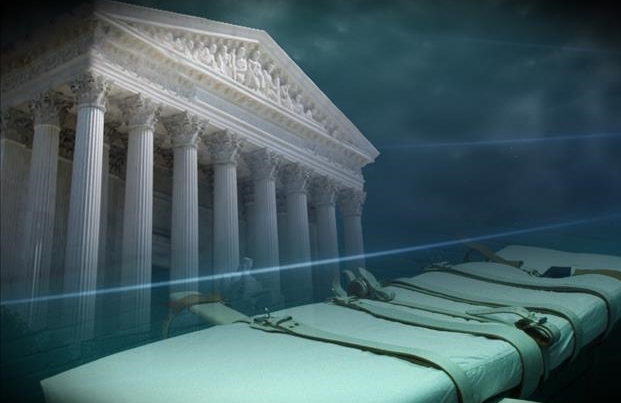 OKLAHOMA CITY (AP) – Oklahoma and Florida moved quickly to resume lethal injections after the U.S. Supreme Court upheld the use of midazolam, a sedative that has been used in several problematic executions. Attorneys general in both states asked courts Monday to allow executions to proceed, just hours after the high court voted 5-4 in a case from Oklahoma that midazolam can be used in executions without violating the Eighth Amendment prohibition on cruel and unusual punishment. Prison officials in both states have said previously they were ready to proceed with executions if the use of midazolam were upheld, but neither would disclose Monday how many doses they have. Oklahoma Attorney General Scott Pruitt sent notice to the state Court of Criminal Appeals that Richard Eugene Glossip, John Marion Grant and Benjamin Robert Cole have exhausted their appeals and may be executed as early as Aug. 5. “The families in these three cases have waited a combined 48 years for justice,” Pruitt said in a statement. In Florida, Attorney General Pam Bondi asked the state Supreme Court to lift the stay on the execution of Jerry Correll, who was convicted in the 1985 killing of four people in Orlando. He had won a temporary reprieve while the high court was reviewing the Oklahoma case. Florida has used midazolam in 11 executions with no apparent difficulties, but executions last year in Arizona, Ohio and Oklahoma took longer than usual and raised concerns that the drug did not perform its intended task of putting inmates into a coma-like sleep. Execution protocols in Alabama, Arkansas, Louisiana and Virginia allow for midazolam, but those states have not used it. Unlike other execution drugs that have become difficult for states to obtain because of opposition by manufacturers, mostly based in Europe, there are numerous manufacturers of midazolam. Several states, including Oklahoma, have had no problems obtaining the common surgical sedative, although one manufacturer, Illinois-based Akorn, announced in April it was taking steps to ensure midazolam is no longer made available to states for use in executions. Oklahoma first used the drug last year in the execution of Clayton Lockett, who writhed on the gurney, moaned and clenched his teeth for several minutes before prison officials tried to halt the process; he died 43 minutes after it was first injected. The state then increased by five times the amount of midazolam it uses and executed Charles Warner in January. He complained of a burning sensation but showed no other obvious signs of physical distress. While the U.S. Supreme Court narrowly upheld the use of the drug, two dissenting justices – Justice Stephen Breyer and Justice Ruth Bader Ginsburg – said for the first time they think it’s “highly likely” the death penalty itself is unconstitutional. Justice Samuel Alito, in writing for the conservative majority, said arguments that the drug could not be used effectively in executions as a sedative were speculative. But Dale Baich, an attorney for the three Oklahoma inmates who challenged the use of midazolam, said litigation is certain to continue.